What a great day! 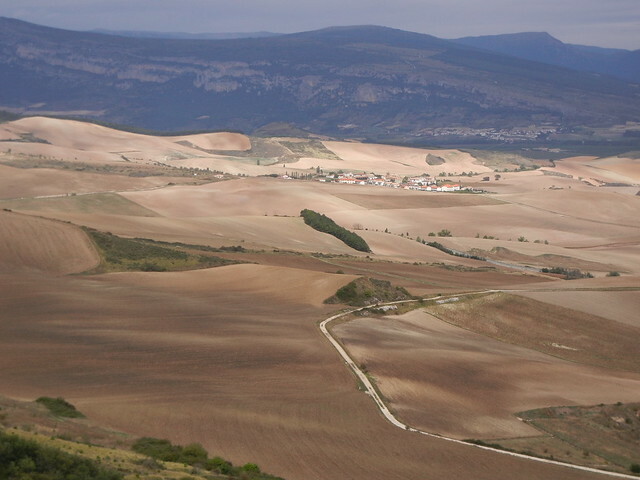 We hiked the “Alto del Perdon” (Hill of Forgiveness) at an altitude of 790 metres and it wasn’t hard at all. That could mean one of two things, or maybe even both: (1) that we are getting fitter or (2) that we aren’t carrying a heavy burden of sin. We left Cizur Menor just after 8 o’clock, the standard time for us to hit the trail. The first 6.2 km. 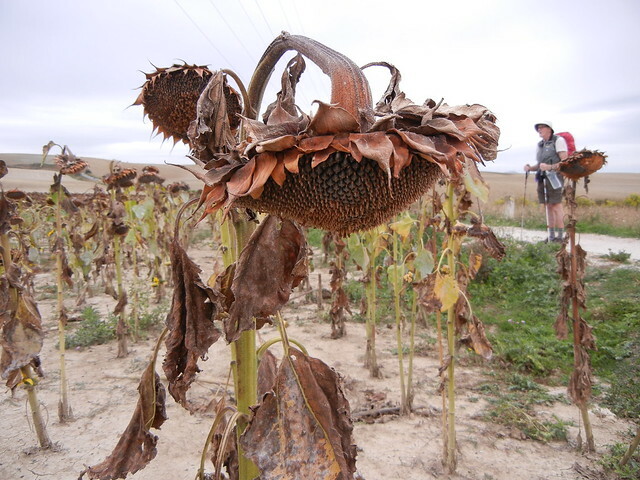 was mostly through plowed fields and sunflowers that had seen better days. About half way up the Hill of Forgiveness, we stopped at Zariquiegui for breakfast. By then we had worked up a good appetite for a cafe con leche, banana, and a pastry and sat at an outside table and conversed with two ladies from Minnesota. Many other peregrinos sat on the walkway with their backs against the wall as there weren’t enough seats for everyone. It might have been the sign that read “WE SERVE THE BEST COFFEE!” that attracted so many peregrinos here. 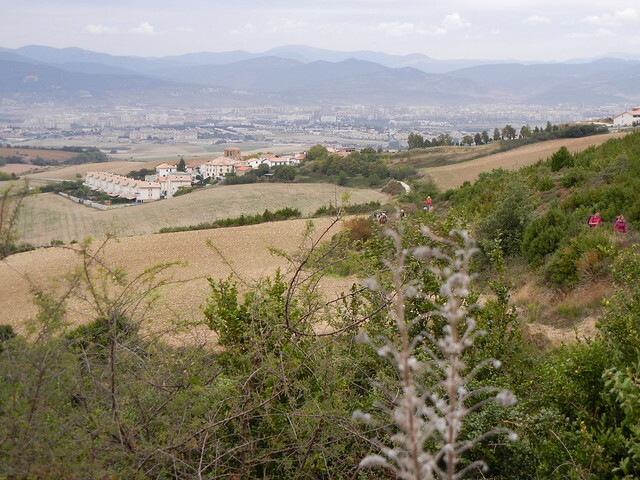 Once we were well fortified we continued climbing, all the while enjoying the wonderful views back over Pamplona. Just below the ridge is an ancient spring (usually dry). There is a story about a medieval pilgrim who reached this spot dying of thirst. The devil, disguised as a pilgrim, offered to show him a spring if he would only renounce God. The pilgrim refused and St. James himself miraculously appeared, revealing the spring and quenching his thirst with water served in a scallop shell. 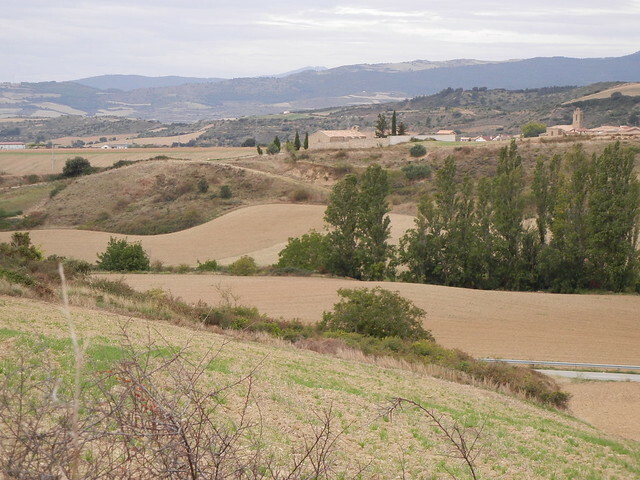 The scallop shell has become a symbol of the Camino. 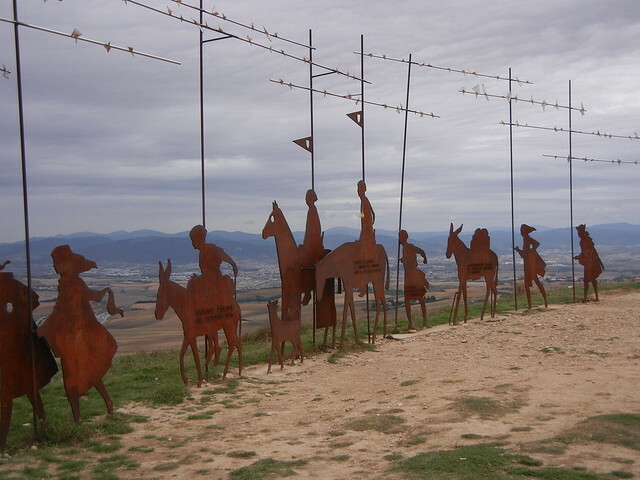 Eventually we passed through the row of wind turbines that line the crest of the hill and came to the wrought iron representation of medieval pilgrims, heads bent to the west wind. We had fun posing amongst them just like Tom and his new friends did in the movie, “The Way.” Looking down the other side of the ridge, we could see the villages we would soon be passing through, including the one we would be staying in, Uterga. What goes up must come down! The way down was over loose rocks that threatened to roll and throw us off balance if we weren’t careful. At least the loose rocks were dry; wet ones would have posed an even greater hazard. A fierce wind accompanied us all the way from the top of the hill down to Uterga, 3.7 km. away. Rather than sleep in a dormitory with about 12 sets of bunk beds, we decided on a private room with shower. It wasn’t great, but at least it was private. We shared a simple pilgrim’s dinner with two ladies from South Africa and two from Italy, and now are back in our room, trying to come to terms with some technological challenges. The Internet is awfully slow and one of our cameras is broken. We’ll try to find a replacement, but we might just have to manage with one camera and hope it hangs in there. Is there a hidden meaning behind these challenges we are facing? What lesson can we learn? It was the name of the hill that we were climbing that got me thinking about forgiveness. When we try to do our best but fail, is there any need to be forgiven? Can we put a positive spin on failures by treating them as lessons learned? Judy, so enjoying reading your posts. Amazing photos and content. We all feel that we are there with you. 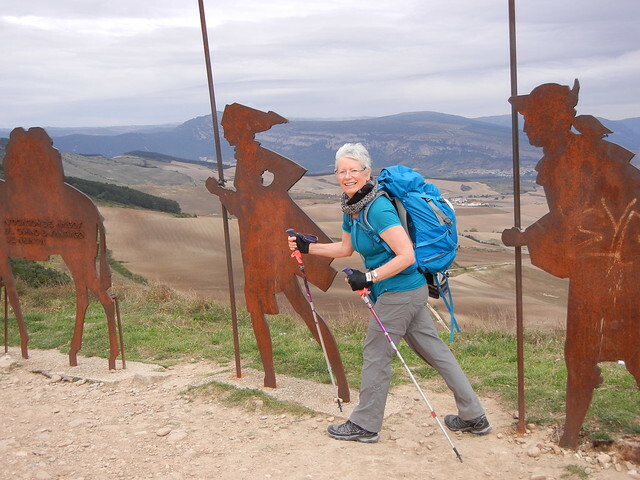 The lazy woman’s way to do the Camino! Keep safe. Keep walking and keep posting. Hmmm . . . Still reading the blog – all in 1 go to day 11. Am starting to think I should talk Arnie into going . . . beautiful scenery . . . great exercise . . . Europa! Talk Arnie into going! We arrived in Santiago after walking for 50 days. We highly recommend it! Catherine, if you succeed with Arnie, please let me know. I’m working on Bob! I so want to be there with you, Judy and Dave. Do it, Marg! 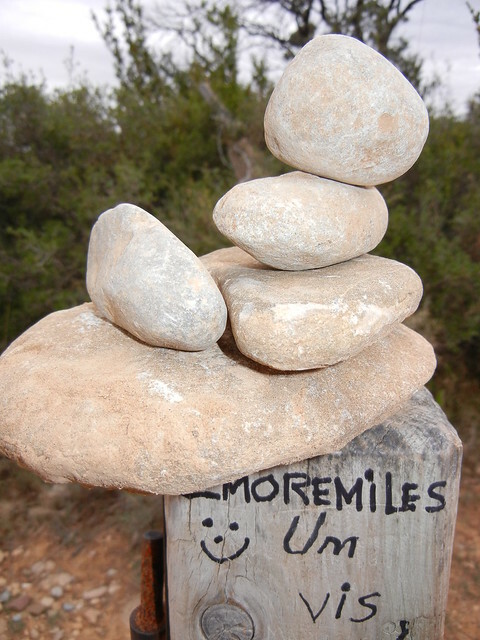 We walked for fifty days and loved it!